Applied Aeronautics LLC has announced the official release of its Albatross UAV platform. The Albatross fixed-wing UAV will be the first in a line of products designed to provide high-performance UAV technology for businesses and individuals at hobby-grade pricing. Applied Aeronautics have called upon their expertise and have pioneered the cutting edge Albatross UAV to provide an efficient, attainable solution able to adapt to the full range of applications in constant use by today’s businesses and airplane enthusiasts. The Albatross UAV was designed to be the most efficient of its kind. This means low stall speeds, high max efficiency, a large cruise window and payload capacity, self-cooling fuselage, built-in component bays, an entirely electric propulsion system, and a 10 foot wingspan. This equates to less energy expended and more time in the air. The Albatross UAV integrates this efficient design with modern technology in a robust platform that is nearly silent and can fly for over 2 hours, reach speeds of up to 90 MPH and travel for over 100 miles. It can cruise efficiently at 17-20 m/s (38-45 MPH) with a top speed approaching 40 m/s (9 MPH). Its transformative design also allows for dynamic use. By configuring the airframe with one of Applied’s kits or Ready to Fly models, the Albatross can takeoff, fly and land autonomously via predefined flight paths. It can complete long-distance and duration surveys, and inspect property and assets. By adding a thermal camera, it can assist fire fighters with dangerous tasks, keeping them out of harms way. 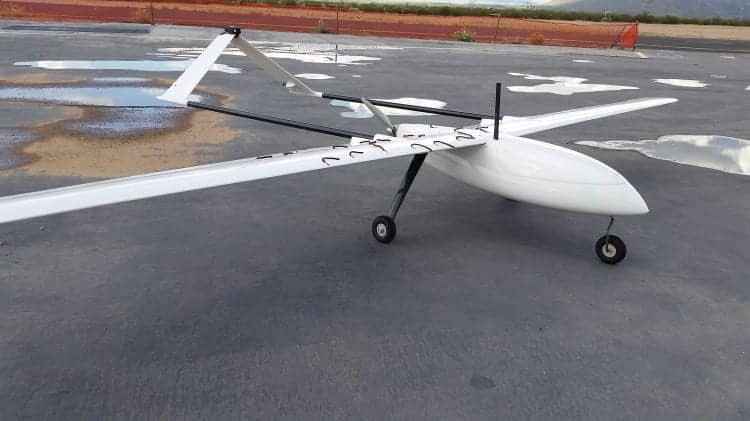 In conjunction with the launch of the Albatross UAV, Applied Aeronautics also announced the launch of its line of supporting products, starting with the Dual Screen Daylight Readable Ground Station. The Dual Screen Ground Station is a daylight readable, rugged and self-contained computer. It allows the customer to control the Albatross and watch video in real time. The station incorporates an Intel Dual Core 1.86 GHZ computer, 64 GB solid-state drive, 4GB of ram, wireless networking, 3 panel mounted USB ports and 2+ hours of battery life. Applied also offers hand-held tablet ground stations, flat mapping gimbals and high-definition video links in its line of supporting products.